Katahdin Potato | Gurney's Seed & Nursery Co.
Great for winter soups and stews! 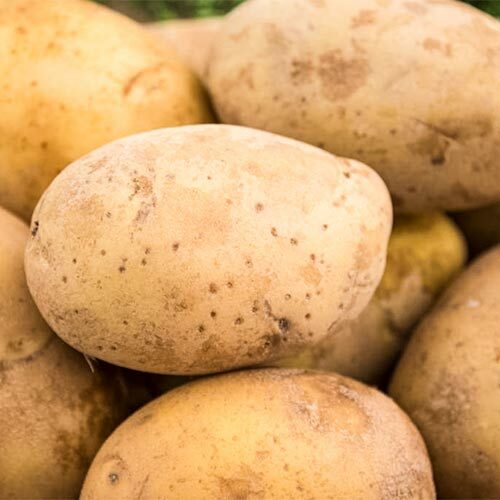 Grow heavy-yields of drought-resistant heirloom potatoes that have excellent storage ability and are great for steaming, boiling, mashing or baking. This white-flesh, buff-skin potato has a flat-round shape and matures late in the season. The best potato for late winter soups and stews! Seed Count2 lbs. of seed potatoes will make approximately 10 - 15 potato sets when cut. CommentsFertilize at planting time. Mound soil over row as plants emerge to protect tubers from turning green in sun. Can be stored at 40-50 degrees F(cooler temps turn starch to sugar and warmer temps may cause them to sprout). *SPRINKLE A TABLESPOON OF 10-10-10 FERTILIZER IN THE SPACE BETWEEN EACH POTATO PIECE. DO NOT APPLY THE FERTILZER DIRECTLY TO THE POTATOES AS IT CAN BURN THE TUBERS. AFTER PLANTS ARE 8-10 inches TALL, USE A HOE AND PILE SEVERAL INCHES OF SOIL UP AROUND THE STEMS; THIS IS CALLED HILLING. THIS PREVENTS EXPOSURE TO THE SUN WHICH CASUSES TUBERS TO BECOME GREEN AND INEDIBLE. YieldHeavy yields, drought resistant. Since a single plant will likely produce up to 2-4 pounds, the yield from a 10' row could be anywhere from 25-35 pounds.